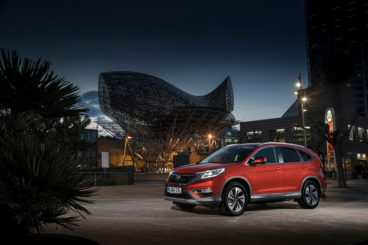 The new Honda CR-V Estate is perhaps the best family car that Honda has ever produced. It’s comfortable, reliable and well-put together. And thanks to its SUV body style, it’s super practical. Whatever a family can throw at it, the 2016 CR-V is well equipped to cope. If you’re looking for a dependable family car that eschews all the glitz we normally associate with brands such as Audi and BMW, the Honda is an interesting option. It’s easy to drive, does the basics well, and is incredibly versatile. The best bit? It’shassle-freee – provided you avoid the nine-speed automatic gearbox. OSV takes a closer look at what it’s all about with our Honda CR-V Estate review. Sure, this Honda isn’t capable of matching the likes of BMW for driving position, but no one buys this car for a party. Generally, customers looking at the CR-V want comfort and reliability. It offers both, and thanks to a two-wheel drive system available on some models, it also feels agile and even nimble at times. However, if you opt for a four-wheel-drive model, you will have to put up with numb, unresponsive steering, as well as heavy body lean in bends. Moreover, the car comes with a 9-speed automatic transmission, which is not always the fastest at responding. And nine gears seems like a lot to choose from for a car such as this. The CR-V Estate offers good ride quality, and even the basic model is comfortable and soft. Opt for the eye-catching bigger alloys, though, and you will lose some of that softness. The larger alloys will also let more sound into the cabin. There are just three engines in the range, including a pair of diesels and a petrol unit. A 1.6-litre 118bhp diesel engine is our top pick. It’s hushed as you fire it up, and doesn’t get much noisier as you increase the speed. It’s the entry level, but it still has enough power to get you from rest to 62mph in 11.2 seconds. It also avoids the nine-speed automatic ‘box, and is instead mated to a manual transmission. The more powerful diesel engine offers more performance, and covers the 0-62mph sprint in 9.2 seconds. This one can be paired up with the nine-speed automatic gearbox, though a five-speed is an alternative. Neither are fantastic, with the latter reducing fuel economy. The petrol engine, meanwhile, is both quieter and smoother than the diesel options. It can do 0-62mph in 10.0 seconds, but it will cost more to run. The interior is hit and miss. The dash is well put together, but parts look their age. And while some of the materials are of a good quality others are less so. Indeed, if you look hard enough, you will find an array of cheap plastics that are rather tacky. The swooping dashboard looks great, though, and overall the family-friendly, toned-down interior is meant to serve as a rival to the more showy interiors found in the likes of a BMW or a Mercedes. It’s also really easy to get comfortable in the car, thanks to soft suspension and a little external noise. Visibility is good, thanks to the raised ride height, while the steering wheel and driver’s seat are both adjustable. Practicality is all but assured, thanks to the Honda CR-V’s SUV body style. Head and legroom are good, both up front and in the back, and five people should be able to sit in comfort, even on longer journeys. Indeed, adults in the rear will have no problems stretching out their legs, and the car really benefits from the lack of a transmission tunnel. Storage space is also excellent and includes a trio of cup holders in your centre console and a huge bin that occupies the space between the front seats. The boot is class-leading and measures 589-litres. It’s easy to use, thanks to a big opening and a lip that’s almost entirely flat. Standard equipment across the range is pretty good, with the entry-level model getting climate control, small alloys, an alarm, cruise control and a DAB digital radio. 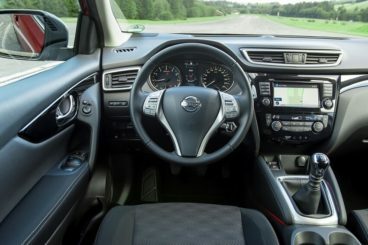 The SE model looks good, and comes with automatic lights and wipers, Bluetooth phone connectivity, parking sensors and a steering wheel that benefits from leather trim. Move up to the Navi model and you get satellite navigation, while the SR model throws in automatic dipping headlights. The range-topping Black Edition rounds things off with leather seats, 19” alloys and Garmin sat nav. If you want a bit more style, the optional extras list is worth a look. A revised front grille will set you back £270, while you can add a roof spoiler for £395. We also like the panoramic sunroof, which lets in more light. Prices for the new car start out from around £22,700, and rise to just over £36,000. For more information on our leasing deals, you can check our page here. Whilst running costs here are not terrible, they are outdone by rivals. For example, while the average fuel economy of 64.2mpg returned by the 1.6-litre 118bhp two-wheel-drive diesel engine looks good, it’s a number that is bettered elsewhere in this class. That engine lands you with a £30 a year tax bill, while there are many engines in this sector that are free to tax. Still, £30 a year doesn’t sound half bad when compared to the £130 a year you’ll have to stump up if you opt for the 158bhp diesel and wed it to the nine-speed automatic ‘box. Moreover, it can’t achieve fuel economy returns any better than 55.4mpg. (Tax prices are right as of Dec 2016. These will change April 2017. Read the article about the changes here). The petrol is the worst offender of them all, though, and averages 39.2mpg while landing you with an annual road tax bill of £205. This is also not a car that is cheap to insure, with the entry-level 1.6-litre diesel occupying group 24. The most expensive model sits in group 27. Luggage capacity is the best in this class, storage space is impressive, and the car is able to deal very well with the everyday demands of a family. It’s not often that we can wax lyrical on standard kit in this sector, but this is a fairly expensive car that comes with a pleasing amount of standard equipment right across the board. It’s all safely designed and won’t excite you, but the cabin is built to last and will cope with whatever your family needs it cope with. The lack of two extra seats diminishes its versatility somewhat, and you might want to take a look at seven-seat rivals if you need the extra space. Expensive to run, clunky, slow to make a change and has too many gears. Need we go on? Let’s see how the car measures up against its rivals in the comparison section of our Honda CR-V Estate review. The new Nissan Qashqai has a lot to do if it’s to convince you that it’s a better product than the Honda, but lower running costs and stylish looks might tip the balance in its favour. The Qashqai does comfort as well as the CR-V Estate, but it also offers an entertaining drive, too. The comfortable suspension does a good job of resisting body lean, and the car doesn’t twitch at every little input. 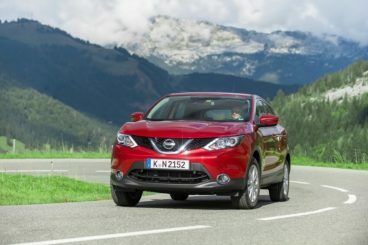 Active Ride Control has improved braking immeasurably, while even with larger wheels the Qashqai does a good job at absorbing bumps and lumps. The entry-level 1.5-litre diesel engine is suitable for motorway cruising, and although it isn’t especially fast, taking as it does 12.4 seconds to cover the 0-62mph dash, it’s got enough going for it to be our top pick. The Nissan Qashqai is a lot cheaper to run than the Honda, and is capable of returning 74.3mpg while costing nothing to tax in its most frugal form. Overall, it benefits from being a small SUV, and no engine is going to rinse you at the pumps. The most expensive engine to run is the 1.6-litre DIG-T petrol, which achieves fuel economy returns of 48.7mpg while costing £130 a year in road tax. The Nissan is also cheaper to buy outright and insure, with insurance group 19 as high as it gets. 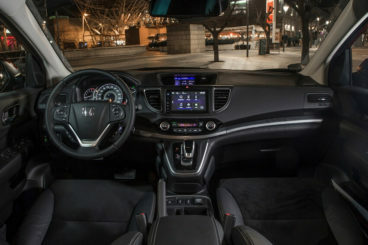 The interior is robust, hi-tech, and can match the Honda CR-V 2016 when it comes to standard kit. The dash features lots of soft-touch plastics and feels built to last, while its buttons are user-friendly and easy to locate. Comfort is assured by a height adjustable driver’s seat and steering wheel, while external noise is kept to a minimum. Thanks to plenty of storage space, a raised roof, and a commanding view of the road, the 2016 Nissan Qashqai is practical. Parking sensors are a must-have, while head and legroom is good for those seated in the front and the rear. The boot, though, measures just 430-litres, which falls way short of the one in the Honda. The new Hyundai Santa Fe Estate is a more practical choice than the CR-V because it can offer seven seats. It’s also comfortable and comes with Hyundai’s enticing five-year warranty. Like the Honda, this Hyundai is more capable and reliable than fun to drive. The suspension set has been worked on extensively so that it can deal with our worst bumps and lumps, and although it can feel a bit on the firm side at times, it mostly does a good job of keeping the car composed. The Santa Fe is prone to the odd body lean, thanks to its sheer size, but comes with the brands Flex Steer system, which lets you switch between a trio of steering modes – Comfort, Normal and Sport. 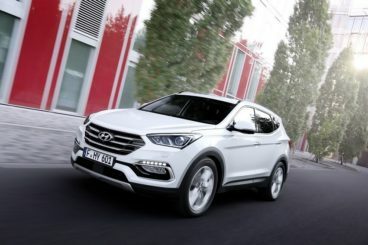 There is only one engine available, a 2.2-litre turbocharged 197bhp diesel that has enough shove in it to make the Santa Fe feel lively on the move. If you pair it up with the manual gearbox, 0-62mph can be done in 9.0 seconds, which seems astonishing when you consider how bulky this machine is. However, the engine feels sluggish at slow speeds, and you need to exert a bit of patience as you wait for the turbocharger to really kick in. The engine is also large, which has a negative impact on running costs. If fuel economy is a priority of yours, it makes a lot of sense to mate the engine to the manual transmission so that it averages returns of 46.7mpg while costing £185 a year in tax. Opt for the automatic, and those numbers change to 42.2mpg and £230. Like the CR-V, this 2016 Hyundai Santa Fe Estate’s interior is unremarkable to look at. It’s smart, but it’s not going to inspire. There are some good quality materials in here, but you won’t be looking too long before you come across some scratchier surfaces. The cabin is mostly well-insulated from external noises, but the engine does begin to rattle as you put your foot down. This is a solid seven-seater alternative to the Honda if you feel as though you could do with added practicality. The extra two seats are really for children only, and you will probably limit their usage to now and then. However, they do come on hand as storage space. Space is good up front and in the rear, while the raised seating position affords you excellent visibility. The boot is right up there with the Honda’s, and measures 585-litres. Featuring a class-leading boot, this is one of the most practical cars on the road at the moment. It feels premium this time around, but continues to be as usable as it has been for the last twenty or-so years. Economy is good, as is refinement, and there is in fact little to contest about the Hyundai CR-V Estate, which although highly priced, can be all yours for a very reasonable leasing deal.